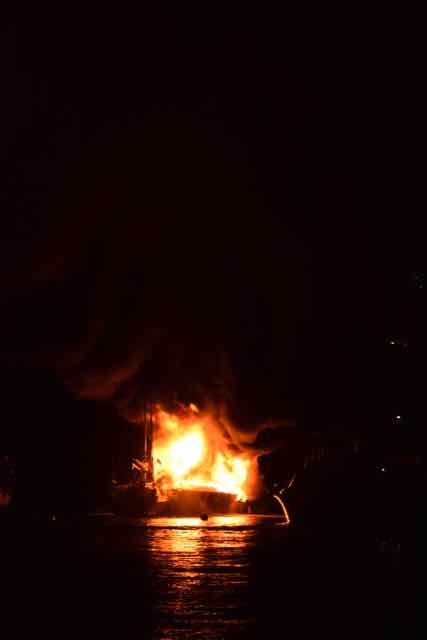 At least three boats are in flames, and there may be damage to the pier. Milou is safe, although we scrambled off our mooring that was directly downwind of the fire. We’ll try to post updates tomorrow. Update: three boats destroyed–two sport fishing boats and one sailboat. The sport fishing boat that caught on fire initially had a guy sleeping on it; he swam to safety, and was hospitalized for smoke inhalation. When the fire reached the mooring lines, the boat drifted into the other two boats, and then against the pier, near the gas dock. All three boats were eventually towed, still aflame, towards shore, where they were still smoldering this morning. The pier has already been repaired. The only other injury we heard about were broken ribs from a spectator, who fell down some steps. Photo of the initial powerboat running into the sailboat. All our other pics were pretty blurry…nighttime photography from a moving boat is a tough skill! ← Hey, hey, hey; it’s canal day! When the feces impacts the rotary cooling unit… yuch. Sorry for those who lost boats. Glad no one more badly injured. We’ll email you the pic when we get better internet, if we can find it! Glad you are ok and I bet that was scary for all, you don’t hear about boats burning that much, lucky not many injuries…. Beth, boats go up SO FAST! Even though he knew we were safe, T was pretty freaked out by how quickly the sailboat caught fire. It was another good opportunity to talk about safety on our own boat. Fiberglass is – basically – congealed oil and glass fibers. It really does burn like that, but with an incredible amount of toxic smoke to boot. Good to know you and Milou are safe! Sounds likes canal day will be good to move things forward!